This name uses Spanish naming customs; the first or paternal family name is Batista and the second or maternal family name is Zaldívar. Fulgencio Batista y Zaldívar (Spanish: [fulˈxensjo βaˈtista i salˈdiβar]; January 16, 1901 – August 6, 1973) was the elected President of Cuba from 1940 to 1944, and dictator from 1952 to 1959, before being overthrown as a result of the Cuban Revolution. Batista initially rose to power as part of the 1933 "Revolt of the Sergeants" that overthrew the authoritarian rule of Gerardo Machado. Batista then appointed himself chief of the armed forces, with the rank of colonel, and effectively controlled the five-member Presidency. He maintained this control through a string of puppet presidents until 1940, when he was himself elected President of Cuba on a populist platform. He then instated the 1940 Constitution of Cuba, considered progressive for its time, and served until 1944. After finishing his term he lived in the United States, returning to Cuba to run for president in 1952. Facing certain electoral defeat, he led a military coup that preempted the election. Back in power, Batista suspended the 1940 Constitution and revoked most political liberties, including the right to strike. He then aligned with the wealthiest landowners who owned the largest sugar plantations, and presided over a stagnating economy that widened the gap between rich and poor Cubans. Batista's increasingly corrupt and repressive regime then began to systematically profit from the exploitation of Cuba's commercial interests, by negotiating lucrative relationships with the American mafia, who controlled the drug, gambling, and prostitution businesses in Havana, and with large multinational American corporations that had invested considerable amounts of money in Cuba. To quell the growing discontent amongst the populace—which was subsequently displayed through frequent student riots and demonstrations—Batista established tighter censorship of the media, while also utilizing his anti-Communist secret police to carry out wide-scale violence, torture and public executions; ultimately killing anywhere from 1,000 to 20,000 people. For several years until 1959, the Batista regime received financial, military, and logistical support from the United States of America. Catalyzing the resistance to such tactics, for two years (December 1956 – December 1958) Fidel Castro's July 26 Movement and other nationalist rebelling elements led an urban and rural-based guerrilla uprising against Batista's regime, which culminated in his eventual defeat by rebels under the command of Che Guevara at the Battle of Santa Clara on New Year's Day 1959. Batista immediately fled the island with an amassed personal fortune to the Dominican Republic, where strongman and previous military ally Rafael Trujillo held power. Batista eventually found political asylum in Portugal, where he lived until dying of a heart attack on August 6, 1973 near Marbella, Spain. Batista was born in Banes, Cuba in 1901, to Belisario Batista Palermo and Carmela Zaldívar González, who had fought in the Cuban War of Independence. He was of mixed Spanish, African, Indian with a part Chinese father. His mother named him Rubén and gave him her last name, Zaldívar. His father did not want to register him as a Batista. In the registration records of the Banes courthouse he was legally Rubén Zaldívar until 1939, when, as Fulgencio Batista, he became a presidential candidate and it was discovered that this name did not exist. Some have alleged that a judge was bribed 15,000 Cuban pesos (about the same amount in U.S. dollars at the time) to fix the discrepancy. Both Batista's parents are believed to have been of mixed race and one may have had Indian blood. Batista himself was initially educated at a public school in Banes, later attending night classes at an American Quaker school. He left home at fourteen, following the death of his mother. Coming from a humble background, he earned a living as a laborer in the cane fields, docks, and railroads. He was a tailor, mechanic, charcoal vendor and fruit peddler. In 1921, he traveled to Havana and joined the army as a private in April of that year. After learning shorthand and typing, Batista left the army in 1923, working briefly as a teacher of stenography before enlisting in the Guardia Rural (rural police). He transferred back to the army as a corporal, becoming secretary to a regimental colonel. In September 1933, he held the rank of sergeant stenographer and as such acted as the secretary of a group of non-commissioned officers who led a "sergeant's conspiracy" for better conditions and improved prospects of promotion. The Pentarchy of 1933 was a five-man Presidency of Cuba, including José M. Irisari, Porfirio Franca, Guillermo Portela, Ramón Grau, and Sergio Carbó. Fulgencio Batista, who controlled the armed forces, appears at far right. In 1933, Batista led an uprising called the Revolt of the Sergeants, as part of the coup that overthrew the government of Gerardo Machado. Machado was succeeded by Carlos Manuel de Céspedes y Quesada, who lacked a political coalition that could sustain him and was soon replaced. A short-lived five-member presidency, known as the Pentarchy of 1933, was established. It included a representative from each anti-Machado faction. Batista was not a member, but controlled Cuba's armed forces. Within days, the representative for the students and professors of the University of Havana, Ramón Grau San Martín, was made president—and Batista became the Army Chief of Staff, with the rank of colonel, effectively putting him in control of the presidency. The majority of the commissioned officer corps were forced to retire or, some speculate, were killed. Batista (left) with his first wife Elisa Godinez-Gómez on a 1938 visit to Washington, D.C.
Grau remained president for just over 100 days before Batista, conspiring with the U.S. envoy Sumner Welles, forced him to resign in January 1934. Grau was replaced by Carlos Mendieta, and within five days the U.S. recognized Cuba's new government, which lasted eleven months. Batista then became the strongman behind a succession of puppet presidents until he was himself elected president in 1940. After Mendieta, succeeding governments were led by José Barnet (5 months) and Miguel Mariano Gómez (7 months) before Federico Laredo Brú ruled from December 1936 to October 1940. 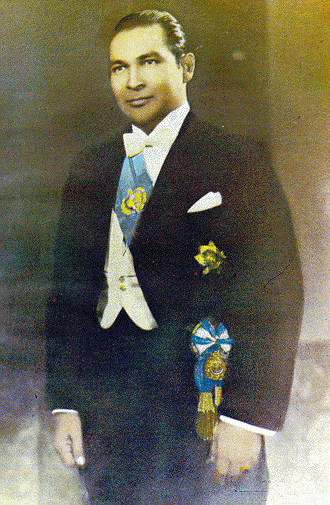 Batista, supported by the "Democratic Socialist" coalition which included Julio Antonio Mella's Communist Party, defeated Grau in the first presidential election under the new Cuban constitution in the 1940 election, and served a four-year term as President of Cuba, the first non-white Cuban in that office. Although Batista supported capitalism and admired the United States, he was endorsed by the old Communist Party of Cuba, which at the time had little significance and no chance of an electoral victory. This support was primarily due to Batista's labor laws and his support for labor unions, with which the Communists had close ties. In fact, Communists attacked the anti-Batista opposition, saying Grau and others were "fascists" and "reactionaries." During this term in office, Batista carried out major social reforms and established numerous economic regulations and pro-union policies. Cuba entered World War II on the side of the Allies on December 8, 1941, declaring war on Japan the day after the attack on Pearl Harbor. On December 11, the Batista government declared war on Germany and Italy. 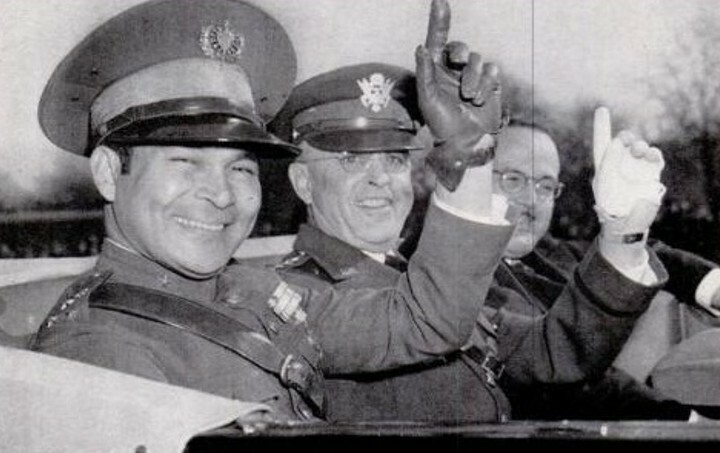 In December 1942, after a friendly visit to Washington, Batista said Latin America would applaud a decision by the United Nations to go to war with Francisco Franco's Spain, calling the regime fascist. It is becoming increasingly apparent that President Batista intends to discomfit the incoming Administration in every way possible, particularly financially. A systematic raid on the Treasury is in full swing with the result that Dr. Grau will probably find empty coffers when he takes office on October 10. It is blatant that President Batista desires that Dr. Grau San Martin should assume obligations which in fairness and equity should be a matter of settlement by the present Administration. Shortly after his successor was inaugurated, Batista left Cuba for the United States. "I just felt safer there," he said. He divorced his wife, Elisa, and married Marta Fernández Batista in 1945. Two of their four children were born in the United States. For the next eight years Batista remained in the background, spending time in the Waldorf-Astoria in New York City and a home in Daytona Beach, Florida. He continued to participate in Cuban politics, and was elected to the Cuban Senate in absentia in 1948. Returning to Cuba, he decided to run for president and was given permission by President Grau, whereupon he formed the United Action Party. He later founded the Progressive Action Party, on taking power, but never regained his former popular support, though the unions supported him until the end. In 1952, Batista again ran for president. In a three-way race, Roberto Agramonte of the Ortodox Party led in all the polls, followed by Carlos Hevia of the Autentic Party. Batista's United Action coalition was running a distant third. On March 10, 1952, three months before the elections, Batista, with army backing, staged a coup and seized power. He ousted outgoing President Carlos Prío Socarrás, canceled the elections, and took control of the government as "provisional president." Shortly after the coup, the United States government recognized his regime. When asked by the U.S. government to analyze Batista's Cuba, Arthur M. Schlesinger, Jr. said "The corruption of the Government, the brutality of the police, the regime's indifference to the needs of the people for education, medical care, housing, for social justice and economic justice ... is an open invitation to revolution." Again in power, Batista did not continue the progressive social policies of his earlier term. He wanted recognition by the upper strata of Cuban society, which had never accepted him in their social circles. He also worked to increase his personal fortune. Upon his seizure of power, Batista inherited a country that was relatively prosperous for Latin America. Although a third of the population still lived in poverty, Cuba was one of the five most developed countries in the region. In the 1950s, Cuba's gross domestic product (GDP) per capita was roughly equal to that of Italy at the time, although Cuba's GDP per capita was still only a sixth as large as that of the United States. Moreover, despite the fact that corruption and inequality were rife under Batista, Cuban industrial worker's wages rose significantly. According to the International Labor Organization, the average industrial salary in Cuba was the world's eighth-highest in 1958, and the average agricultural wage was higher than some European nations. 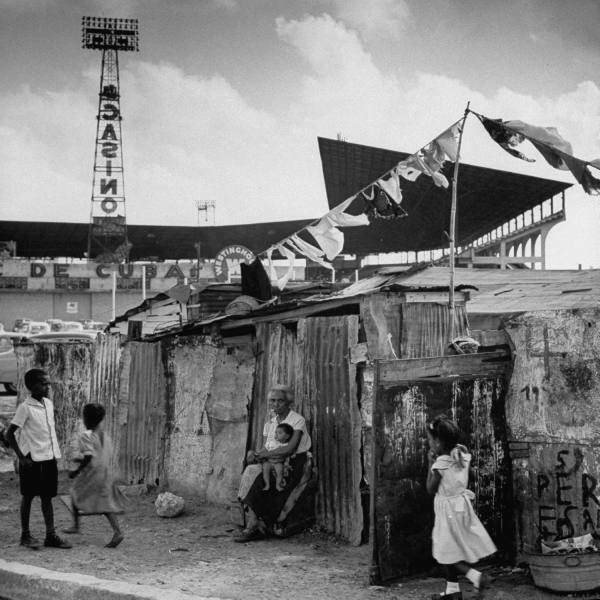 However, despite an array of positive indicators, in 1953, the average Cuban family only had an income of $6.00 a week, while 15 to 20 percent of the labor force were chronically unemployed, and only a third of the homes had running water. Constantino Arias' photo titled Ugly American, showing a 1950s Batista-era tourist in Havana, Cuba. In the 1950s, Havana served as "a hedonistic playground for the world's elite", producing sizable gambling, prostitution and drug profits for American Mafiosos, corrupt law-enforcement officials and their politically elected cronies. In fact, drugs, be it marijuana or cocaine, were so plentiful at the time that one American magazine in 1950 proclaimed "Narcotics are hardly more difficult to obtain in Cuba than a shot of rum. And only slightly more expensive." In a bid to profit from such an environment, Batista established lasting relationships with organized crime, notably with American mobsters Meyer Lansky and Lucky Luciano, and under his rule Havana became known as "the Latin Las Vegas." Batista and Lansky formed a friendship and business relationship that flourished for a decade. During a stay at the Waldorf-Astoria in New York in the late 1940s, it was mutually agreed that, in return for kickbacks, Batista would give Lansky and the Mafia control of Havana's racetracks and casinos. After World War II, American mobster Lucky Luciano was paroled from prison on the condition that he permanently return to Sicily. Luciano secretly moved to Cuba, where he worked to resume control over American Mafia operations. Luciano also ran a number of casinos in Cuba with the sanction of Batista, though the American government eventually succeeded in pressuring the Batista regime to deport him. Batista encouraged large-scale gambling in Havana. 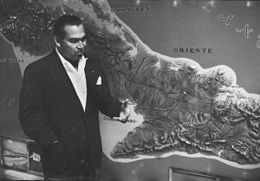 In 1955, he announced that Cuba would grant a gaming license to anyone who invested US$1 million in a hotel or $200,000 in a new nightclub—and that the government would provide matching public funds for construction, a 10-year tax exemption, and waive duties on imported equipment and furnishings for new hotels. Each casino would pay the government $250,000 for the license, plus a percentage of the profits. The policy omitted background checks, as required for casino operations in the United States, which opened the door for casino investors with illegally obtained funds. Cuban contractors with the right connections made windfalls by importing, duty-free, more materials than needed for new hotels and selling the surplus to others. It was rumored that, besides the $250,000 to obtain a license, an additional "under the table" fee was sometimes required. Lansky became a prominent figure in Cuba's gambling operations, and exerted influence over Batista's casino policies. Lansky also turned Cuba into an international drug trafficking port. The Mafia's Havana Conference was held on December 22, 1946 at the Hotel Nacional de Cuba; this was the first full-scale meeting of American underworld leaders since the Chicago meeting in 1932. Lansky set about cleaning up the games at the Montmartre Club, which soon became the "place to be" in Havana. He also wanted to open a casino in the Hotel Nacional, the most elegant hotel in Havana. Batista endorsed Lansky's idea over the objections of American expatriates such as Ernest Hemingway, and the renovated casino wing opened for business in 1955 with a show by Eartha Kitt. The casino was an immediate success. As the new hotels, nightclubs, and casinos opened, Batista collected his share of the profits. Nightly, the "bagman" for his wife collected 10 percent of the profits at Santo Trafficante's interests, the Sans Souci cabaret, and the casinos in the hotels Sevilla-Biltmore, Commodoro, Deauville, and Capri (partly owned by the actor George Raft). His take from the Lansky casinos—his prized Habana Riviera, the Hotel Nacional, the Montmartre Club, and others—was said to be 30 percent. Lansky was said to have personally contributed millions of dollars per year to Batista's Swiss bank accounts. The Golden Telephone presented to Batista now resides in Havana's Museum of the Revolution as a symbol of Batista era corruption. In a manner that antagonized the Cuban people, the U.S. government used its influence to advance the interests of and increase the profits of the private American companies, which "dominated the island's economy." As a symbol of this relationship, ITT Corporation, an American-owned multinational telephone company, presented Batista with a Golden Telephone, as an "expression of gratitude" for the "excessive telephone rate increase" that Batista granted at the urging of the U.S. government. Earl T. Smith, former U.S. Ambassador to Cuba, testified to the U.S. Senate in 1960 that, "Until Castro, the U.S. was so overwhelmingly influential in Cuba that the American ambassador was the second most important man, sometimes even more important than the Cuban president." In addition, nearly "all aid" from the U.S. to Batista's regime was in the "form of weapons assistance," which "merely strengthened the Batista dictatorship" and "completely failed to advance the economic welfare of the Cuban people." Such actions later "enabled Castro and the Communists to encourage the growing belief that America was indifferent to Cuban aspirations for a decent life." "Fulgencio Batista murdered 20,000 Cubans in seven years ... and he turned Democratic Cuba into a complete police state—destroying every individual liberty. Yet our aid to his regime, and the ineptness of our policies, enabled Batista to invoke the name of the United States in support of his reign of terror. Administration spokesmen publicly praised Batista—hailed him as a staunch ally and a good friend—at a time when Batista was murdering thousands, destroying the last vestiges of freedom, and stealing hundreds of millions of dollars from the Cuban people, and we failed to press for free elections." On July 26, 1953, just over a year after Batista's second coup, a small group of revolutionaries attacked the Moncada Barracks in Santiago. Government forces easily defeated the assault and jailed its leaders, while many others fled the country. The primary leader of the attack, Fidel Castro, was a young attorney who had run for parliament in the canceled 1952 elections. Although Castro was never officially nominated, he felt that Batista's coup had sidetracked what would have been a promising political career for him. In the wake of the Moncada assault, Batista suspended constitutional guarantees and increasingly relied on police tactics in an attempt to "frighten the population through open displays of brutality." Batista held an election in 1954, running as the candidate of a political coalition that included the Progressive Action Party, the Radical Union Party, and the Liberal Party. The opposition divided into abstentionists and electoralists. The abstentionists favored boycotting the elections regardless of the circumstances in which they were held, whereas the electoralists sought certain rights and guarantees to participate. The CIA had predicted that Batista would use any means necessary to ensure he won the election. Batista lived up to their expectations, utilizing fraud and intimidation to secure his presidency. This led most of the other parties to boycott the elections. Former President Ramón Grau San Martín, leading the electoralist factions of the Cuban Revolutionary Party, participated through the political campaign but withdrew from the campaign days before election day, charging that his supporters had been terrorized. Thus, Batista was elected president with the support of 45.6% registered voters. Despite the boycott, Grau received the support of 6.8% of those who voted. The remaining voters abstained. By late 1955, student riots and anti-Batista demonstrations had become frequent, and unemployment became a problem as graduates entering the workforce could not find jobs. These were dealt with through increasing repression. All youth were seen as suspected revolutionaries. Due to its continued opposition to Batista and the large amount of revolutionary activity taking place on its campus, the University of Havana was temporarily closed on November 30, 1956 (it did not reopen until 1959 under the first revolutionary government). On March 13, 1957, student leader José Antonio Echeverría was killed by police outside Radio Reloj in Havana after announcing that Batista had been killed in a student attack on the Presidential Palace. In reality, Batista survived, and the students of the FEU and DR who led the attack were killed in the response by the military and police. Ironically, Castro quickly condemned the attack, since the July 26 Movement had not participated in it. In April 1956, Batista called popular military leader Col. Ramón Barquín back to Cuba from his post as military attaché to the United States. Believing Barquín would support his rule, Batista promoted him to General. However, Barquín's Conspiración de los Puros (Conspiracy of the Pure) was already underway and had already progressed too far. On April 6, 1956, Barquín led hundreds of career officers in a coup, but was frustrated by Lieutenant Ríos Morejón, who betrayed the plan. Barquín was sentenced to solitary confinement for eight years on the Isle of Pines, while some officers were sentenced to death for treason. Many others were allowed to remain in the military without reprimand. The purge of the officer corps contributed to the inability of the Cuban army to successfully combat Castro and his guerrillas. Batista's police responded to increasing popular unrest by torturing and killing young men in the cities. His army, however, was ineffective against the rebels based in the Sierra Maestra and Escambray mountains. Another possible explanation for the failure to crush the rebellion was offered by author Carlos Alberto Montaner: "Batista does not finish Fidel out of greed ... His is a government of thieves. To have this small guerrilla band in the mountains is to his advantage, so that he can order special defense expenditures that they can steal." Batista's rule became increasingly unpopular among the population, and the Soviet Union began to secretly support Castro. However, some of Batista's former generals have also criticized him in recent years, saying that Batista's excessive interference in his generals' military plans to defeat the rebels hampered Army morale and rendered all operations ineffective. In an effort to gather information about Castro's army, Batista's secret police pulled in people for questioning. 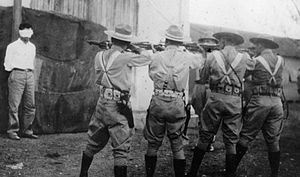 Many innocent people were tortured by Batista's police, while suspects, including youth, were publicly executed as a warning to others who were considering joining the insurgency. Additionally, "Hundreds of mangled bodies were left hanging from lamp posts or dumped in the streets in a grotesque variation of the Spanish colonial practice of public executions." The brutal behavior backfired, and increased support for the guerrillas. In 1958, forty-five organizations signed an open letter supporting the July 26 Movement, among them national bodies representing lawyers, architects, dentists, accountants, and social workers. Castro, who had originally relied on the support of the poor, was now gaining the backing of the influential middle classes. The United States supplied Batista with planes, ships, tanks, and the latest technology, such as napalm, which he used against the insurgency. However, in March 1958, the U. S. announced it would stop selling arms to the Cuban government. Soon after, the U.S. imposed an arms embargo, further weakening the government's position, although land owners and others who benefited from the regime continued to support Batista. Elections were scheduled for June 1958, as required by the Constitution, but were delayed until November 1958, when Castro and the revolutionaries called for a general strike and placed several bombs in civilian areas of the country. Three main candidates ran in the elections: Carlos Márquez Sterling of the Party of the Free People, Former President Ramón Grau San Martín of the Cuban Revolutionary Party-Authentic, and Andrés Rivero Agüero of the government coalition. According to Carlos Márquez Sterling, all three were threatened by Castro, and several assassination attempts were made on both Ramón Grau San Martín and Carlos Márquez Sterling. On Election Day, estimates on the turnout range from 30–50% in the areas where voting took place, which did not include parts of Las Villas and Oriente, which were controlled by Castro. Márquez Sterling also stated that the initial results were favorable to him, but the military ordered the counting to stop as they changed the actual ballots for fraudulent ones. However Grau San Martín, as had previously done in the 1954 elections, withdrew his candidacy within few hours of the election day. Batista declared Rivero Agüero the winner. On December 11, 1958, U.S. Ambassador Earl Smith visited Batista at his hacienda, Kuquine. There, Smith informed him that the United States could no longer support his regime. Batista asked if he could go to his house in Daytona Beach. The ambassador denied the request and suggested that he seek asylum in Spain instead. On December 31, 1958, at a New Year's Eve party, Batista told his Cabinet and top officials that he was leaving the country. After seven years, Batista knew his presidency was over, and he fled the island in the early morning. At three A.M. on January 1, 1959, Batista boarded a plane at Camp Columbia with forty of his supporters and immediate family members. and flew to Ciudad Trujillo in the Dominican Republic. A second plane flew out of Havana later in the night, carrying ministers, officers and the Governor of Havana. Batista took along a personal fortune of more than $300 million that he had amassed through graft and payoffs. Critics accused Batista and his supporters of taking as much as $700 million in fine art and cash with them as they fled into exile. As news of the fall of Batista's government spread through Havana, The New York Times described jubilant crowds pouring into the streets and automobile horns honking. The black and red flag of the July 26 Movement waved on automobiles and buildings. The atmosphere was chaotic. On January 8, 1959, Castro and his army rolled victoriously into Havana. Already denied entry to the United States, Batista sought asylum in Mexico, which also refused him. Portugal's Prime Minister António Salazar allowed him to settle there on the condition that he completely abstain from politics. By the end of Batista's rule, described by U.S. President John F. Kennedy as "one of the most bloody and repressive dictatorships in the long history of Latin American repression," many claim that up to 20,000 Cubans had been killed. He married Elisa Godínez y Gómez (1900–1993) on July 10, 1926, and they had three children: Mirta Caridad (1927–2010), Elisa Aleida (born 1933), and Fulgencio Rubén Batista Godínez (1933–2007). He later married Marta Fernández Miranda (1923–2006), and they had five children: Jorge Luis (born 1942), Roberto Francisco (born 1947), Carlos Manuel (1950–1969), Fulgencio José (born 1953) and Marta María Batista Fernández. He also had a daughter, Fermina Lázara Batista Estévez, in 1935. Marta Fernández Miranda de Batista, Batista's widow, died on October 2, 2006. Roberto Batista, her son, says that she died at her West Palm Beach home. She had suffered from Alzheimer's disease. She was buried with her husband in San Isidro Cemetery in Madrid after a Mass in West Palm Beach. Batista's resignation as president on New Year's Eve 1958-59 is reenacted in a pivotal scene in the Academy Award-winning 1974 film The Godfather Part II, although the Cuban president is not named. The role was played by Tito Alba. ↑ 1.0 1.1 Batista y Zaldívar, Fulgencio by Aimee Estill, Historical Text Archive. ↑ Argote-Freyre, Frank (2006). Fulgencio Batista. 1. New Brunswick, N.J.: Rutgers University Press. p. 50. ISBN 0-8135-3701-0. ↑ Wright, Robert; Wylie, Lana, eds (2009). Our Place in the Sun: Canada and Cuba in the Castro Era. University of Toronto Press. p. 8. ISBN 978-0-8020-9666-1. http://books.google.com/books?id=UwY1yvfHs_IC&pg=PA8. Retrieved July 6, 2013. ↑ Conflict, Order, and Peace in the Americas, by the Lyndon B. Johnson School of Public Affairs, 1978, pg 121 ~ "The US-supported Batista regime killed 20,000 Cubans"
↑ Guerra, Lillian (2010). Beyond Paradox, in A Century of Revolution (Grandin & Joseph). Durham, NC: Duke University Press. pp. 199–238. ↑ 12.0 12.1 "Batista Dies in Spain at 72". New York Times. August 7, 1973. ↑ 18.0 18.1 "Evolution of a Dictator". Time. June 12, 1944. http://www.time.com/time/magazine/article/0,9171,775003,00.html. Retrieved May 3, 2010. ↑ La piel de la memoria by René Dayre Abella. ↑ 23.0 23.1 Frank Argote-Freyre. Fulgencio Batista: Volume 1, From Revolutionary to Strongman. Rutgers University Press, New Jersey. ↑ Leslie Bethell. Cuba. ISBN 978-0-521-43682-3. ↑ 25.0 25.1 25.2 Julia E. Sweig. Inside the Cuban Revolution. ISBN 978-0-674-01612-5. ↑ 26.0 26.1 Jorge I. Domínguez. Cuba. p. 90. ↑ 27.0 27.1 Jorge I. Domínguez. Cuba. ↑ United States Department of State (1944). "Foreign relations of the United States : diplomatic papers, 1944". The American Republics. University of Wisconsin Digital Collections. p. 910. http://digicoll.library.wisc.edu/cgi-bin/FRUS/FRUS-idx?type=turn&entity=FRUS.FRUS1944v07.p0924&id=FRUS.FRUS1944v07&isize=L&q1=grau%20san%20martin. Retrieved April 8, 2010. ↑ "The Cuban revolution at 50: Heroic myth and prosaic failure". The Economist. 30 December 2008. http://www.economist.com/displaystory.cfm?story_id=12851254. ↑ 36.0 36.1 Servando Gonzalez. The Secret Fidel Castro. ↑ Díaz-Briquets, Sergio & Pérez-López, Jorge F. (2006). Corruption in Cuba: Castro and beyond. University of Texas Press. p. 77. ISBN 978-0-292-71482-3. http://books.google.com/books?id=Fiquofr8LSoC&pg=PA77. ↑ Walsh, Daniel C. (2012). An Air War with Cuba. NC, USA: McFarland. pp. 5. ISBN 978-0-7864-6506-4. http://www.mcfarlandbooks.com/book-2.php?id=978-0-7864-6506-4. ↑ Fulgencio Batista y Zaldivar. Respuesta: Primera Edición. México, D.F. Impresa Manuel León Sanchez. 1960. ↑ Manuel Marquez-Sterling. Cuba 1952–1959: The True Story of Castro's Rise to Power. Wintergreen, Virginia. Kleiopatria Digital Press. 2009. ↑ Paterson, Thomas G. (1995). Contesting Castro: The United States and the Triumph of the Cuban Revolution. Oxford University Press. p. 25. ISBN 978-0-19-510120-1. http://books.google.com/books?id=Vncl-lZq3GcC&pg=PA25. ↑ Mario Riero Hernandez. Cuba Politica. La Habana, Cuba. 1955. ↑ Horowitz, Irving Louis (1988). Cuban communism. New Brunswick, N.J.: Transaction Books. p. 662. ISBN 0-88738-672-5. http://books.google.com/?id=hx2_y7Vu-PUC&pg=PA463. ↑ Thomas, Hugh (March 1971). Cuba; the Pursuit of Freedom. New York: Harper & Row. p. 1173. ISBN 0-06-014259-6. ↑ Historia de Cuba: Desde Colon hasta Castro. Carlos Márquez Sterling. Miami, Florida. 1963. ↑ 59.0 59.1 59.2 Sullivan, Patricia (March 6, 2008). "Ramón M. Barquín, 93; Led Failed '56 Coup in Cuba". Washington Post. http://www.washingtonpost.com/wp-dyn/content/article/2008/03/05/AR2008030503300.html. Retrieved March 31, 2008. ↑ 60.0 60.1 Francisco Tabernilla Palmero and Gabriel E. Taborda. Palabras esperadas: Memorias de Francisco H. Tabernilla Palmero. Ediciones Universales. Miami, Florida. 2009. ↑ DePalma, Anthony (March 6, 2008). "Ramón Barquín, Cuban Colonel, Dies at 93". New York Times. http://www.nytimes.com/2008/03/06/world/americas/06barquin.html?_r=1&em&ex=1204952400&en=fad514edbfcebfa1&ei=5087%0A&oref=slogin. Retrieved March 31, 2008. ↑ Timothy P. Wickham-Crowley. Guerrillas and revolution in Latin America. p. 189. ↑ Louis A. Pérez. Cuba and the United States. ↑ 66.0 66.1 Carlos Márquez Sterling. Memorias de un estadista. Ediciones Universales. Miami, Florida. 2005. ↑ 70.0 70.1 O'Meilia, Tim (October 4, 2006). "Widow of Cuban dictator Batista dies in WPB". Palm Beach Post. ↑ 71.0 71.1 71.2 "Widow of Cuban strongman Batista dies". United Press International. 2006-10-05. http://www.upi.com/NewsTrack/Top_News/2006/10/05/widow_of_cuban_strongman_batista_dies/7347/. Retrieved March 31, 2008. ↑ "Castro: The Great Survivor". BBC News. October 2000. http://news.bbc.co.uk/2/hi/americas/244974.stm. Retrieved May 15, 2006. ↑ Invisible Latin America, by Samuel Shapiro, Ayer Publishing, 1963, ISBN 0-8369-2521-1, pg 77 ~ "All told, Batista's second dictatorship cost the Cuban people some 20,000 dead"
↑ The World Guide 1997/98: A View from the South, by University of Texas, 1997, ISBN 1-869847-43-1, pg 209 ~ "Batista engineered yet another coup, establishing a dictatorial regime, which was responsible for the death of 20,000 Cubans." ↑ The Third World in Perspective, by H. A. Reitsma & J. M. G. Kleinpenning, ISBN 0-8476-7450-9, pg 344 ~ "Under Batista at least 20,000 people were put to death." Wikimedia Commons has media related to Fulgencio Batista.